Traveling in your Peugeot 3008 is very comfortable and enjoyable, but sometimes you need a little more storage space to ensure that you have all of your belongings and gear with you when you are on the road. Rather than leaving behind items that you may need, when you invest in the best roof cargo box for Peugeot 3008, you can rest easy knowing that you will have all of the storage space that you need and that your belongings will be safe and protected from bad weather while you are on the road. Below you’ll find a selection of boxes that work well with the 3008. Do you need Roof Bars? You'll need some roof bars to fit these boxes. 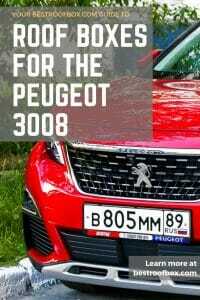 Your best option is the Peugeot Official ones. UK / EU Products As Peugeot is only available in Europe, the product details above are from Amazon.co.uk. If you are in a different country you should be redirected to your local Amazon. This is a great option for a roof cargo box for your Peugeot 3008 because of its aerodynamic design, as well as how quickly and easily you can install it on your roof. It’s made from a Special aeroskin material which makes this box look incredibly stylish. Additionally, the Central locking system provides maximum safety and security. Combined with the dual-side openings, make using this roof box incredibly fast and easy to access. This Thule roof box also features the Patented FastClick quick-mount system with integrated torque indicator for simple and secure fixing. With 430 litres of space inside, it’s easy to see how this roof box has enough room for the gear of a small family. This is a great look box from Thule, that comes in a range of sizes depending on your needs. It’s glossy finish will look great on your 3008 making it a great choice for a family who loves to take road trips and look good! Both the lid and the base of this roof cargo box have been reinforced to ensure that it is secure and durable, and as it’s a Thule you won’t ever have to worry about the roof box failing you when you are on the road. The model we’ve chosen to include, the Ocean 100, can carry a generous 360 litres of luggage. One slight drawback is that it only opens on the passenger side, rather than the duel side opening offered by many other boxes, but this shouldn’t be enough to put you off this box. The rugged build on this roof box ensures that you won’t have to worry about the items you store inside being damaged due to bad weather or being stolen, as it’s durable, strong, and comes with a great lock. This roof cargo box has been made to easily accommodate a large amount of cargo and luggage. Boasting a a carry limit of 530 litres up to a weight of 75kg you’ll be sure that you can get all your things inside. You can rest easy knowing that this roof box will be easy to use, as it features passenger side opening, as well as locking hinges, so that the door doesn’t close when you are loading or unloading the box. The fast installation and removal of this roof box make it a clear contender to be the best roof box for Peugeot 3008. It’s easy to see why, thanks to the quality of materials used in its construction, as well as the design and safety features, this is such a popular box. If storing your Roof Box is a factor for you, then this foldaway design from Thule could be for you. Don’t let the fabric construction put you off. This box is easy to lift and load, offers protection from bad weather, and won’t look out of place on your Peugeot 3008. Even though it is a smaller roof box, it easily holds 280 litres of gear and equipment, and doesn’t require tools for assembly. Made from high quality waterproof material, with taped seams and a sealed zipper with integrated lock it won’t let you down. Because this roof box fits most aftermarket and factory roof bars, it is easy to install it on the roof of your car and to head out for your road trip. This roof box weighs under 9kg and can be installed by a single person in under five minutes, making it a wonderful option if you are in a hurry or if you live by yourself and don’t have someone to help you with the installation process. Let’s be clear, this is a BIG Roof Box! If you need huge amounts of storage capacity when travelling in your 3008 then this box could be for you. This box can comfortably carry a 680 litre load up to 75kg. Don’t be intimidated by it’s size though, it’s still easy to load with duel side opening and secure central lock. Big is also beautiful, as in our opinion this one of the best looking boxes on the market. Even fully loaded this box is more than up to the task. Wind noise, even at speed is minimal, thanks to its aerodynamic design. The Farad F3 is a great value box that can hold anything you through at it. It’s high quality construction combined with a 5 year warranty make this box an excellent choice for the Peugeot 3008. It’s up to you to find the best roof box for Peugeot 3008, but you can rest easy knowing that any of the options on this list are sure to work for you. While they vary in size and the included features, they are all incredibly durable and strong so you don’t need to worry about the safety of your belongings. Additionally, they all offer plenty of storage space without taking up too much room on your roof or making it difficult to drive or open your hatch.